I recently got a first hand look at the wonderful Proven Winners annual introductions for 2012. The first one I will talk about is Supertunia “White Russian”. 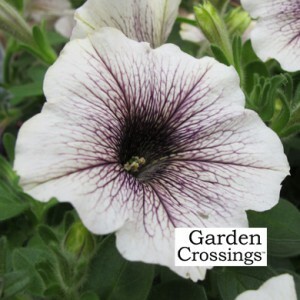 This petunia will give you continuous color all summer long. The white flower has nice chocolate brown/purple veining. 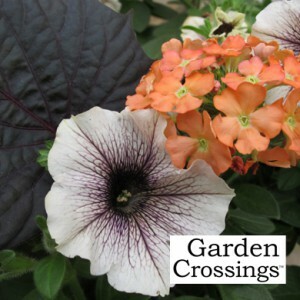 Match ‘White Russian” with the dark foliage of Ipomoea and the veining looks black, mix with pink it takes on a pink color, and when paired with purples… you guessed it, it looks purple. 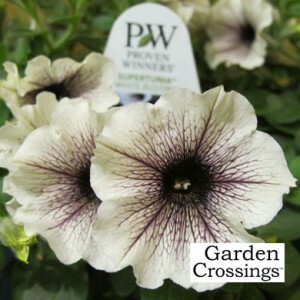 “White Russian” is a trailing petunia and does not need to be dead headed( alot of petunias need to be deadheaded) this is a much cleaner and less sticky type of petunia. “White Russian” is a great plant to use in hanging baskets or patio planters. We do have one very huge to tip to give you when planting up your planters and want to have good results. Fertilizer!!!! You must fertilize and water your plants regularly for the very best results. Also we do recommend that the beginning of July and also early to mid August that you give your plants a ‘haircut’. I generally trim my plant back to the bottom of the pot. 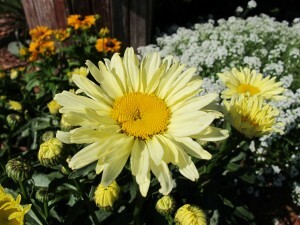 It may sacrifice blooms for a week or so, but the end result is a much nicer/fuller plant. Another great product that I use at my house is the WaterWise system. It is a self watering system that hooks up to my faucet. I do have a timer also so I can set it and forget it.